The Department of Psychology is delighted to host a guest lecture from Steve Sloman, co-author of the recently published work “The Knowledge Illusion: Why We Never Think Alone”. In this talk Steven Sloman will preview his new book The Knowledge Illusion, co-authored with Philip Fernbach. Sloman and Fernbach show us how much the individual mind depends on the minds of others, and that our intelligence comes not only from our brains but also from the knowledge that is stored in our bodies, the environment and other people. Simply put, individuals know relatively little, but the human hive knows a lot. 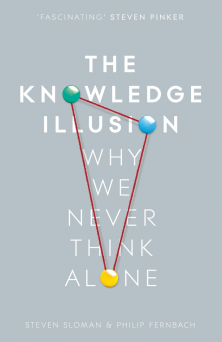 This book examines the origins and consequences of our knowledge illusion, exploring both the extent of our ignorance and the clever ways we overcome it. By recognising the limits of our understanding, we can improve how we approach our most complex problems, from the pros and cons of democracy, to avoiding financial meltdowns.